The Mogotio Area Development Program (ADP) is located in Kenya’s Baringo County, which is classified as Arid and Semi Arid Lands. About 60 per cent of people who live in the Mogotio ADP area are farmers. Income sources are narrow, land holdings are small and many farmers resort to casual labour to support themselves. The area has strong pastoralist roots, but less than two per cent of people are involved in raising livestock, although many are aware the land is suitable for that purpose. 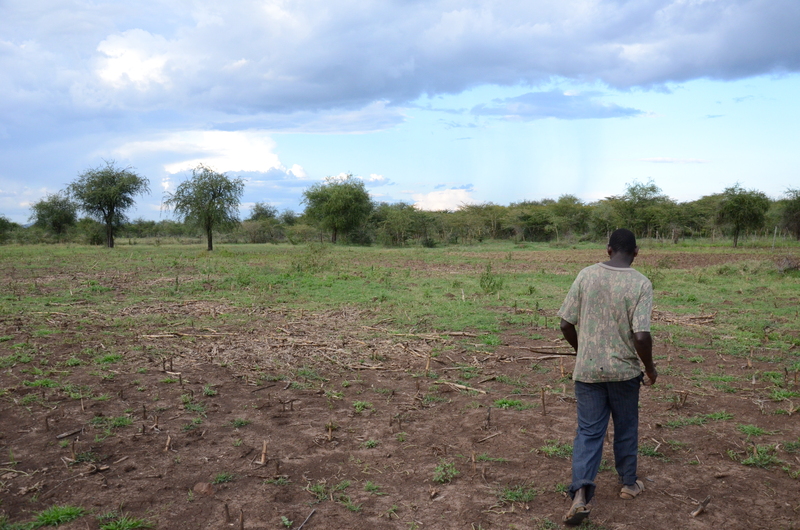 Successive droughts and resulting stock losses have worsened food insecurity in the area, and rainfall is unreliable. Since Kenya gained independence from Britain in 1963, Baringo County has evolved from mostly pastoralism to a combination of farming and dependence on livestock, with a decreasing reliance on the latter. This combination is typically called agro-pastoralism. As in most transitioning and former pastoralist groups, there is an attachment to cattle. Even the poorest household will try to have at least one cow. But herders are now cross-breeding with European varieties for more meat and milk. Many farmers are recognising and practicing the value of destocking or reducing the size of their herds when clear signs of drought are present. The area has a history of destructive environmental practices dating back to the 1970’s, when it was believed that clearing the land of all trees would effectively cleanse the land and promote pasture growth. During the 1970’s and 1980’s mockery greeted those who cited traditional beliefs that a person became cursed for cutting down trees, especially those which provided traditional medicines. Those beliefs fell away. Whole trees were cut down for firewood and charcoal. Others cut the trees to make charcoal as the increasing use of gikos, small metal stoves, made charcoal a highly profitable business in the 1980’s. As a result, grass thrived for only a short time, and throughout excessive droughts the land became arid and prone to erosion during rain events. 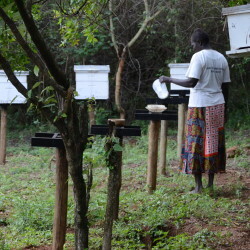 Nancy, a farmer within the Mogotio ADP, attends to her modern beehives. Nancy realised she could keep bees, after FMNR resulted in grass growth and flowering of trees. Farmer Managed Natural Regeneration (FMNR) methods, implemented in the area as part of World Vision’s Mogotio ADP, are opening up new opportunities for communities and allowing farmers to return to their pastoral roots. As part of FMNR methods, thick undergrowth is cleared from around local tree varieties, providing a protective canopy and allowing grass to thrive in the newly created shade. Land once lost to erosion is being reclaimed for productivity and profit. This sets off a series of important changes for the community. More fodder is made available for sale or feeding of animals. Cows are better fed and produce more milk, and growing gardens result in better family nutrition and boosted profits to meet expenses such as school fees and fencing. Increased incomes also allow people to take out loans and buy livestock. The clearing of brush and selective tree pruning provides material that can be used as firewood or turned into valuable charcoal. Farmers including Willy and his wife Nancy harbour no affection for the old days. They cite how their time, until recently, was consumed with leading their cattle a few kilometres to grass and watching over them all day. But this routine has been replaced by the convenience of being able to turn cattle loose in fenced paddocks, allowing for time to be devoted to more productive labour. Nancy is developing her beekeeping business, while another farmer Jonathan is digging water catchments and flooding termite hills. Both are expanding their shambas (kitchen gardens), and selling their produce. World Vision’s Mogotio ADP and particularly the FMNR program align with government efforts at land restoration and economic development. FMNR saves the expensive costs of seedlings, of creating nurseries and of training locals to run them efficiently. Some of the seedlings always die during transfer to local farmers. Therefore this option compares unfavourably with the low costs of FMNR, which involves training farmers, encouraging them, helping to recruit and organise teams of volunteers, and coaching them on best practices. In Baringo County the government is beautifying country roads as part of its first steps towards realising a tourism industry. The national government has a policy of ten per cent tree coverage of all lands. There are also plans to increase livestock health and strengthen breeds so that a vision for a meat processing plant can be realised, in partnership with existing slaughterhouses and an under-utilised tannery.